I really liked the way my first loaf of Ken Forkish's Overnight Country Brown from Flour Water Salt Yeast turned out, so I made the same loaf again with a different shaping method (I will explain it later in this post). 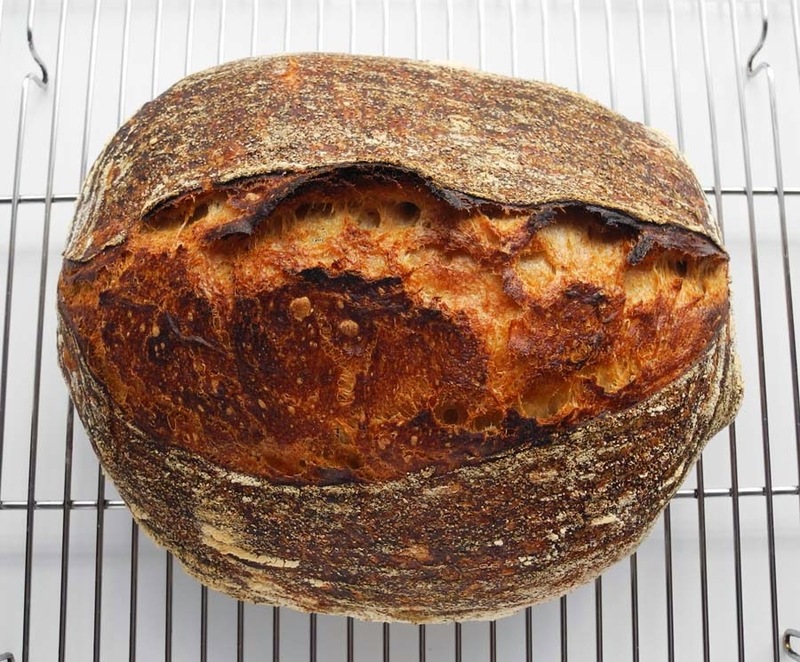 The recipe uses a very long overnight (8-15 hours) bulk fermentation at room temperature, using a small amount of young levain. 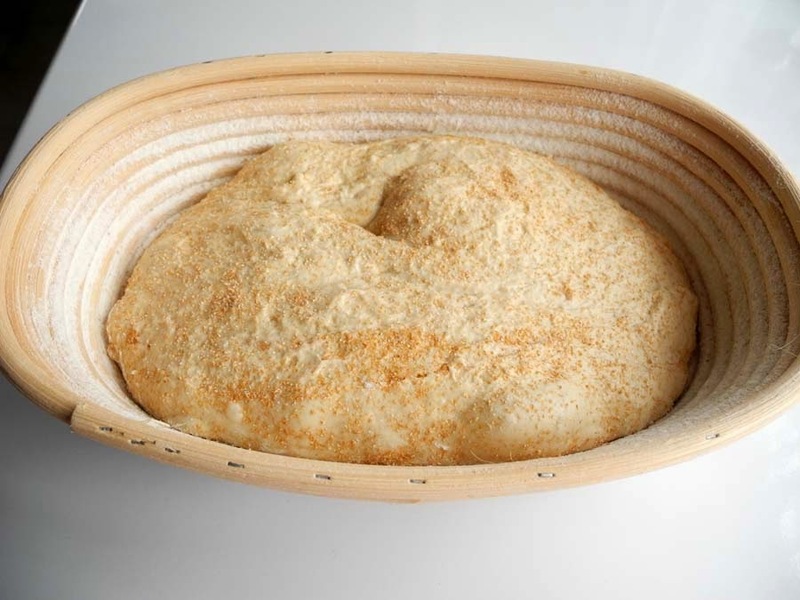 This long slow fermentation process promotes vigorous activity in the dough, developing the gluten fully, resulting in a complex rich aroma fully extracted from the dough and creating a soft flavorful crumb with large irregular-shaped holes. I like the bubbly dough and the wild look of the resulting bread. This is so far my favorite daily bread. This time, as one of my experiments, I used a younger levain that was 5 hours old, which had just passed the float test. In my previous loaf, I used 7 hours old levain by following the original recipe, which had a slight sour smell when I used. I was curious about how the age of levain would affect the taste of the final loaf. 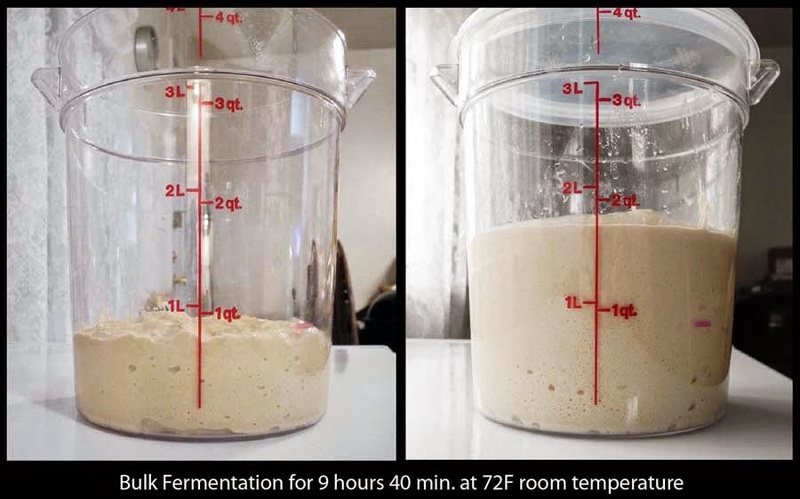 Bulk fermentation was 9 hours and 40 minutes at 72F room temperature, until the dough rose to double. I gave 4 foldings every 25 minutes in the initial 2 hours of bulk fermentation. After the long overnight bulk fermentation, the dough had a mild sweetish smell just like the dough of the Double-Fed Sweet Levain Bread, while the previous dough I made with 7 hours old levain had a rather acidic smell at this stage. Last time when I baked the same loaf, I omitted the pre-shape and bench rest time. But this time, I added pre-shape and 15 minutes bench rest before shaping the final loaf, to see if there would be significant differences in the crumb of the resulting loaf. After the 15 minutes bench rest, I flipped the dough for final shaping. 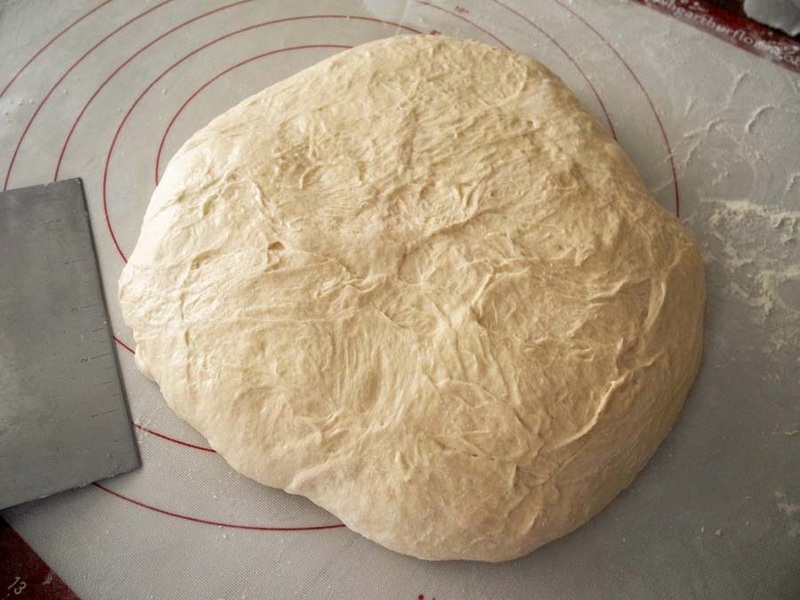 With extra gentle handling, I tried to keep the trapped gases inside the dough as much as possible during the shaping stage. 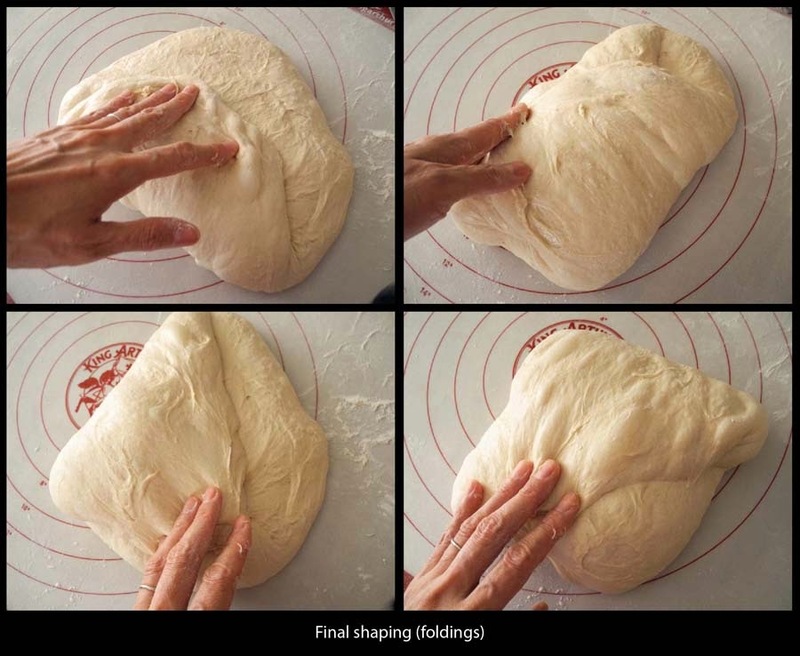 I folded the dough from 4 different angles, and made the loaf a round shape by tucking in the bottom of the dough from every angle by very gently using a bench knife. The shaped loaf was very bubbly and plumpy. I sprinkled some bran on the surface of the loaf, to add flavor and color. 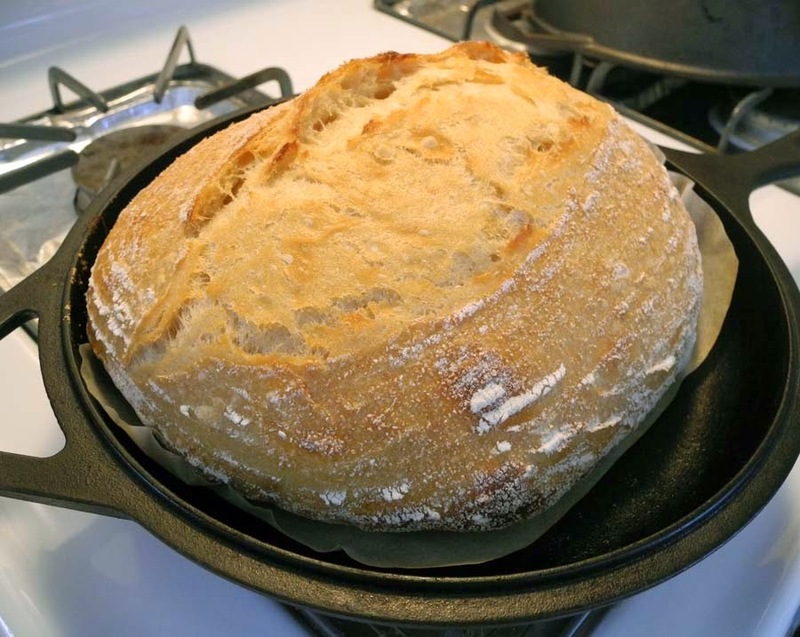 I like the way the crust opens on oval-shaped loaves, so I used an oval basket for the final rise again. 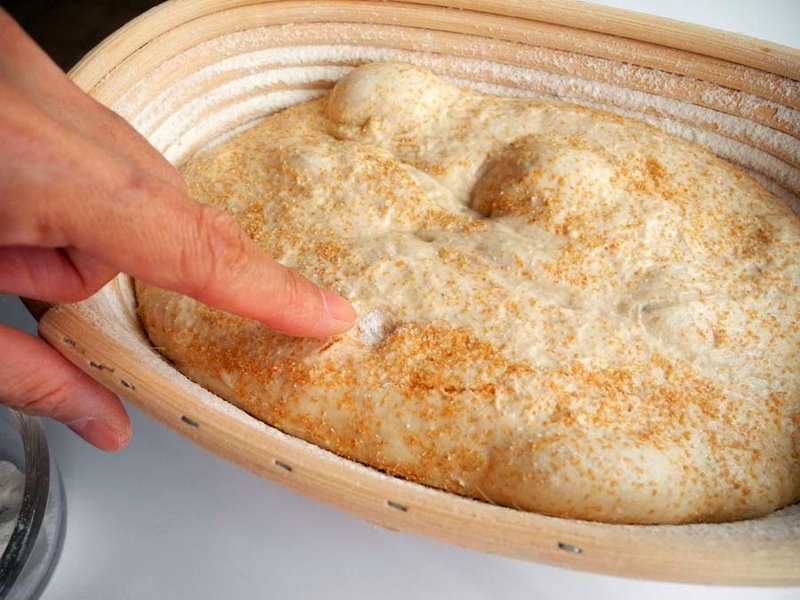 Before placing the shaped loaf in the proofing basket, I sprinkled a 50/50 mixture of rice flour and all-purpose flour inside a basket, so the dough would not stick. After 2 hours and 17 minutes, I tried the 'finger-dent test', the method Forkish instructed in his book to see if the final rise was done. I sprinkled a small amount of rice flour on one spot of the loaf, and poked the spot with my finger. 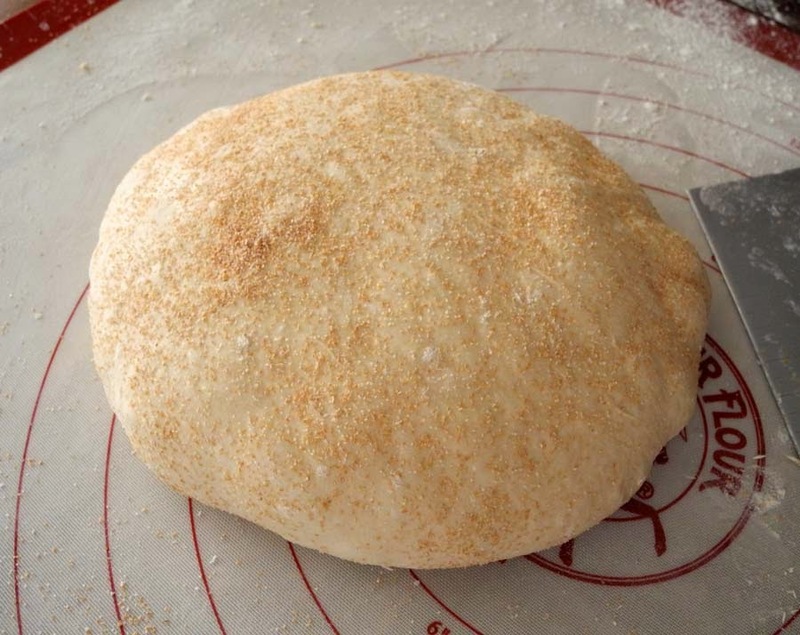 The finger-dent test is a little tricky when the dough is very cold after retarding in the refrigerator, since the cold dough reacts slower. 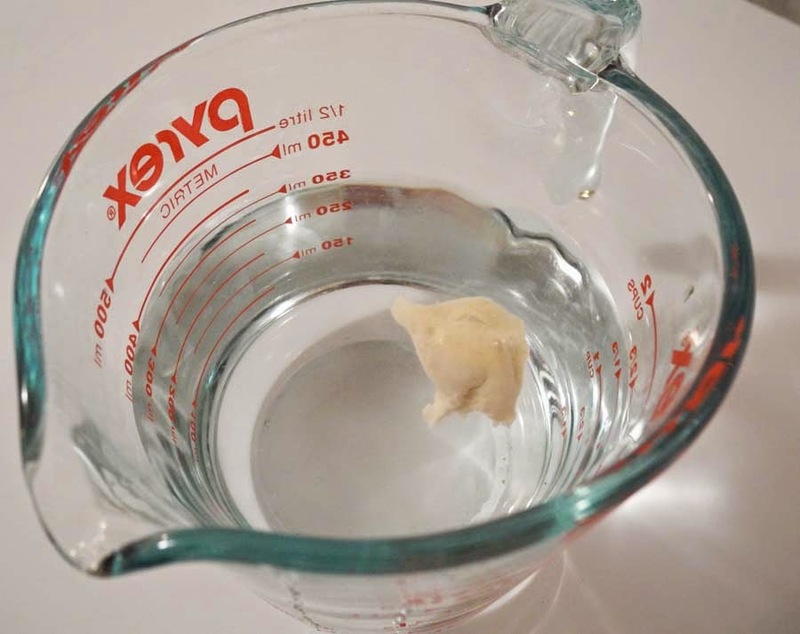 (*Here is a good tip on how to know if the could dough is properly proofed, from The Fresh Loaf discussion board). I left the dough at room temperature for a few minutes, then tried the finger-dent test again. 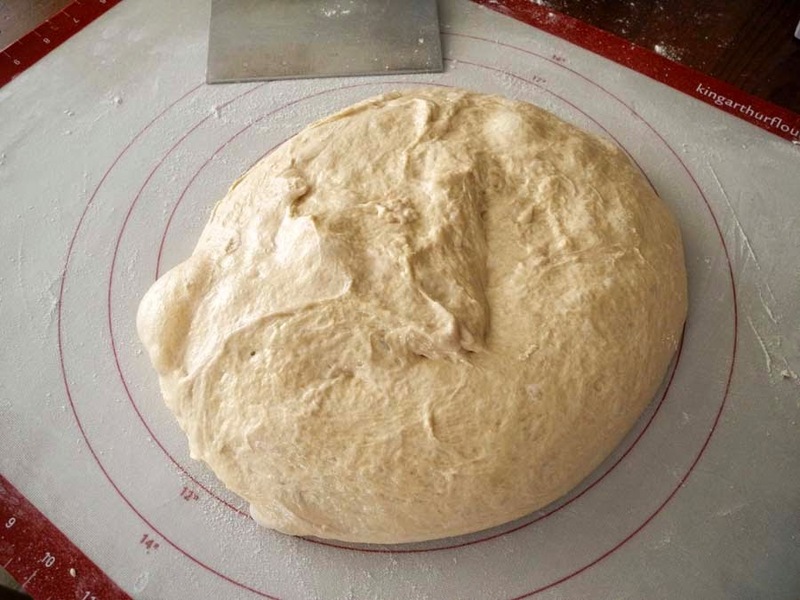 The dough bounced back very slowly, so I judged that it was ready to bake. The proofed loaf was flatter than the previous loaf when I flipped it over onto the parchment paper. 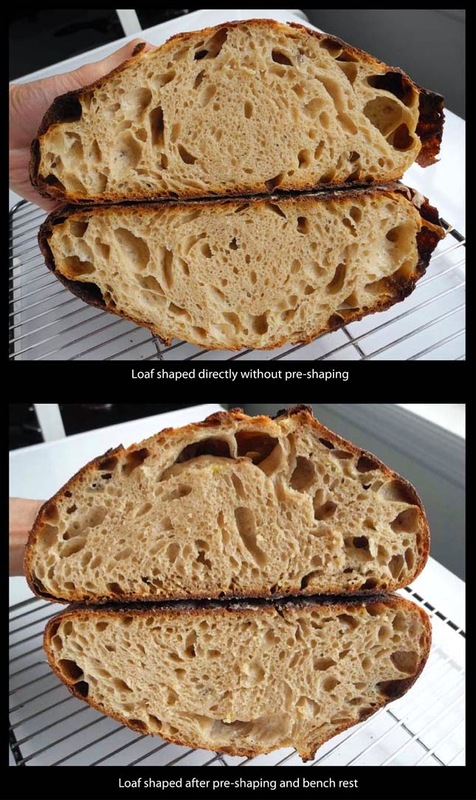 I was afraid that the loaf might not be able to hold its shape in the oven, due to my loose shaping. I placed the loaf onto a preheated combo cooker, wishing that there would be some oven spring. After baking 30 minutes with the lid on, I removed the lid. It had actually a pretty great oven spring, to my surprise. Perhaps the fully developed gluten structure via the long overnight bulk fermentation must have given it strength to help the oven spring. I was again very happy with the thin crisp crust and the deep amber color of the final loaf. 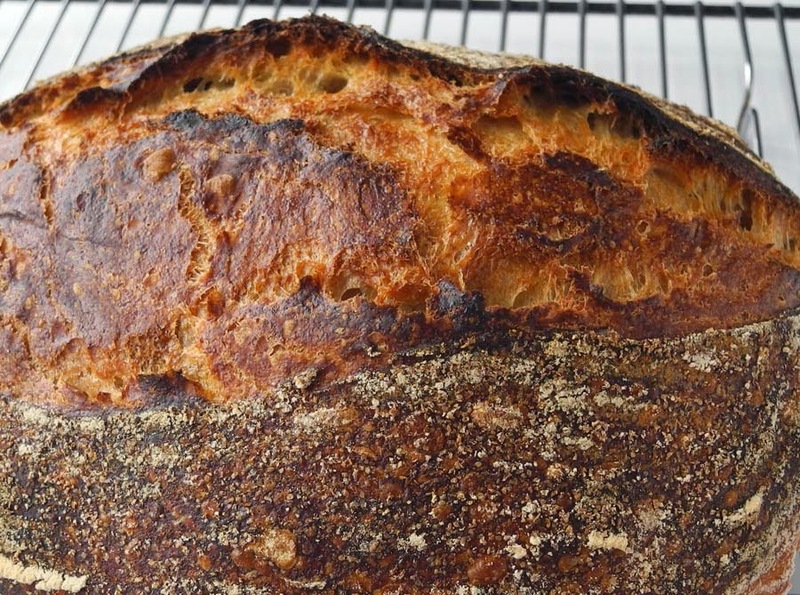 The great thing about this Overnight Country Brown is the aromatic 'umami' flavor developed in the matured dough, that steeps deep into the crust and the crumb of the final loaf. 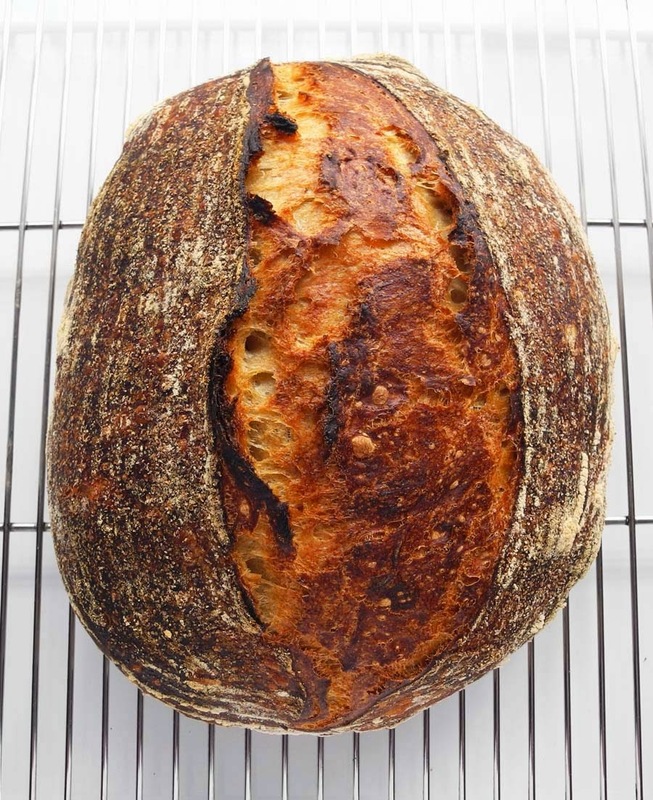 The effect of using younger levain was very subtle – there was a more sweetish aroma in the kitchen while baking, but this loaf had also distinct tanginess right after being baked just as the previous one. However, the tanginess of both loaves mellowed as time passed in a couple of days, so there was not so much recognizable difference in the resulting tastes. The slight hint of tanginess is actually great when having it with some other foods, since the tanginess brightens up the deliciousness of the meal whatever it is, like a nice spice or accent. I love the look of crumb of the Overnight Country Brown loaf. 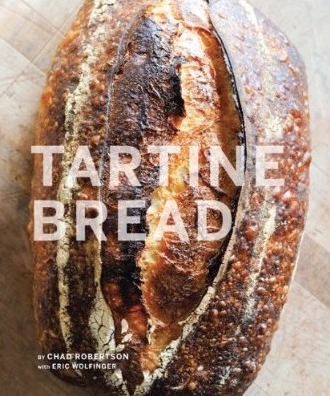 When I was struggling with baking Tartine Country loaves in the past, one of my main issues was that my dough tended to be under-fermented during the bulk fermentation stage (since I was always worried about over-fermentation). 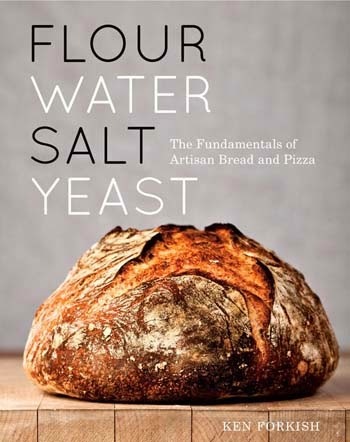 But after baking several loaves from Forkish’s book, I finally came to understand how properly fermented dough should feel and look with fully developed gluten structure that I should aim for during the bulk fermentation. 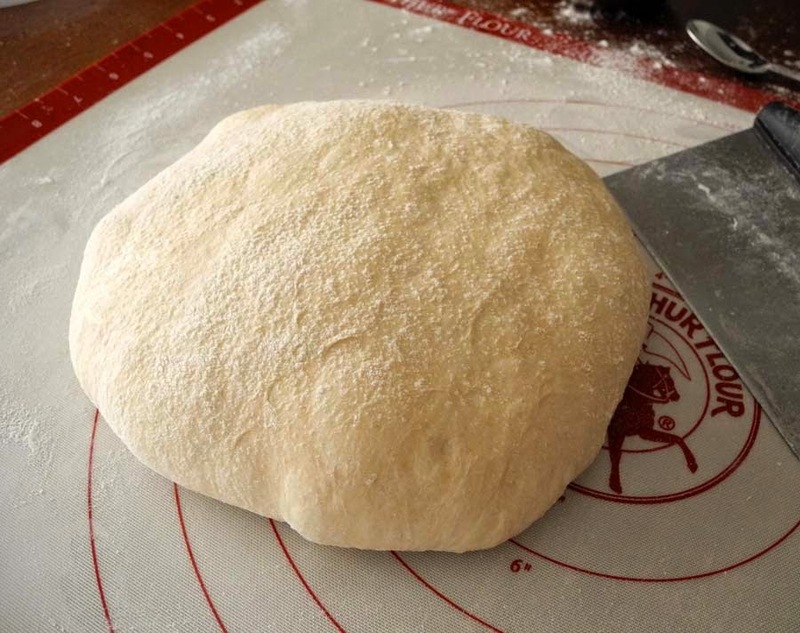 In most of Forkish's recipes, pre-shape was not included in the procedure (except some doughs that contain rye flour). I have been wondering if pre-shape is really necessary, and if so, why. I kind of liked the wild irregular holes in the crumb of the loaf I made without pre-shaping, but I was curious of the differences if I compared these two versions. So for my experiment, I changed the shaping methods in the last two Overnight Country Brown loaves to see if shaping with pre-shaping or without it had some effect on the final shape of the loaf and the crumb. Here is a comparison of the side shot of both: The loaf without pre-shaping and bench rest (above) seemed to have a little weaker dough structure, resulting in somewhat uneven and less oven spring, with one side of the loaf slightly corrupted. 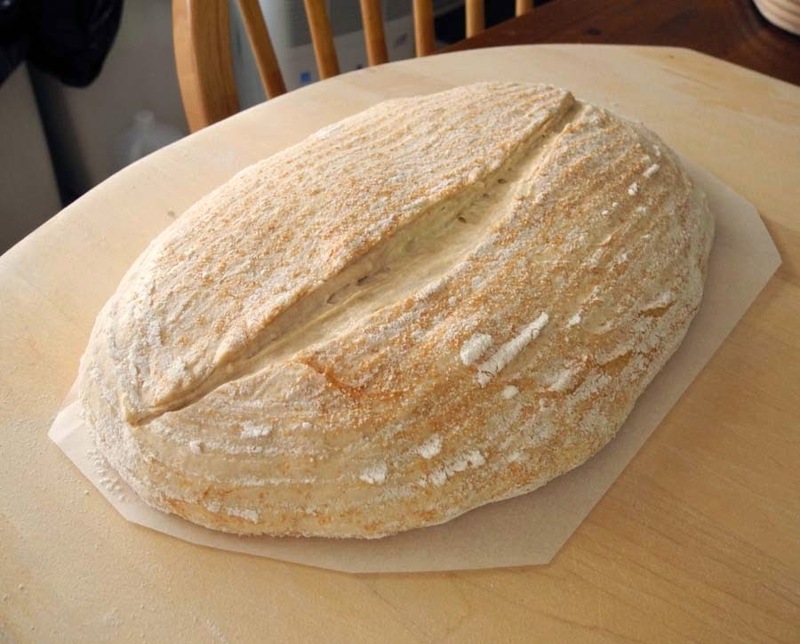 The loaf with pre-shaping (below) seemed to hold the dough structure better, resulting in higher and more even oven spring. 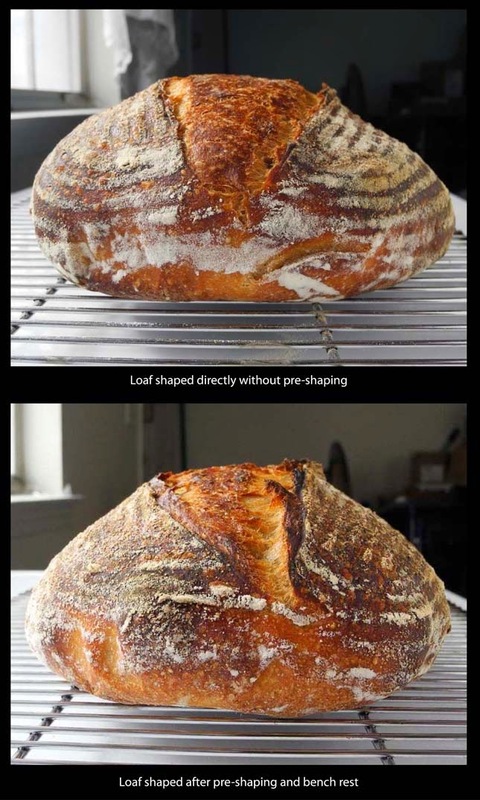 So when it comes to a matter of visual appeal, the loaf with pre-shape was better. The crumb structures of both loaves looked different, too. Both had large air holes, but the holes in the loaf without pre-shaping were not evenly distributed. Meanwhile, the holes in the loaf using pre-shaping and bench rest were more evenly distributed, and the loaf has risen more vertically than the other. 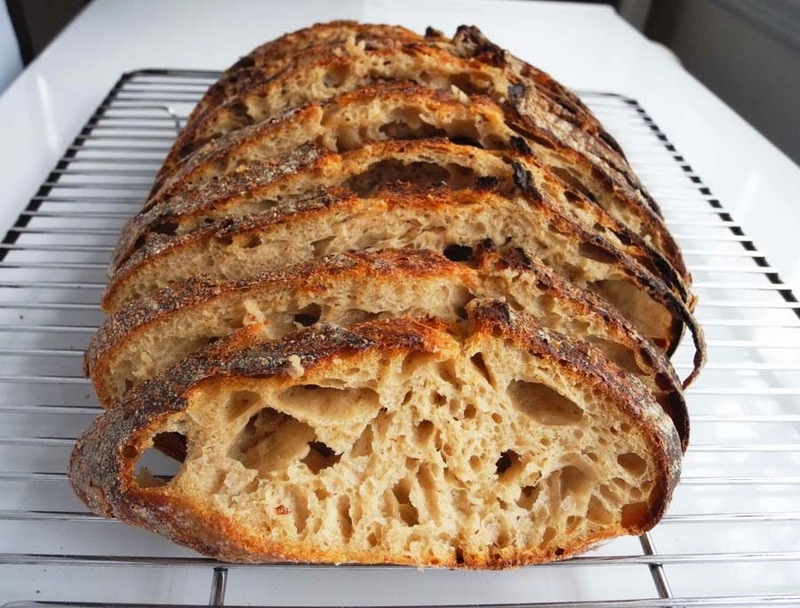 The crumb of the latter showed more dynamic moves of the gluten structure, which must have been the reason of higher oven spring. As for the tastes and the flavors, I must say that both loaves were equally great - really hard to tell which was better. But I kind of think that the crumb of the loaf without pre-shape was somewhat softer and more flavorful, perhaps since the gluten structures were more relaxed and the gases trapped inside the crumb were more intact. I don't really know how the differences actually affected the final loaves, but my conclusion after this experiment was that the pre-shape makes the loaf look better visually, helping the oven spring at maximum. But taste-wise, the loaf without pre-shape was just fine (or could be even better). This is awesome. I have wondered about Forkish lack of pre-shape since I read the book. I do wonder why he does not address this as it seems common practice. Glad to have found your blog. I would like to follow it, not sure how. Hi Yuko! Not sure if you're still active on this blog (I hope you are)! I recently decided to give sourdough a go, I already had some experience with FWSY recipes that use poolish/big or normal yeast. I went for the recipe you're presenting here and completely botched the shaping process. The dough was sticking to everything! I panicked and added too much raw flour, then panicked again and started s&f with wet hands. In the end I gave up and just put it in the banneton, ended up with 0 rise. Could really use your advice. Also, side question: are you shaping on lightly flowered teflon mat? I noticed you are doing your final proof in the fridge. Forkish calls for proofing at rm temp and I was wondering why you prefer the cold proof? Thanks. 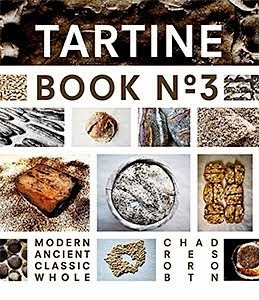 My home baking experiences of artisan bread recipes from the following books. The Puggle. And peanut butter cookies. copyright 2014-2017 © Yuko Zama. Travel theme. Theme images by bloodstone. Powered by Blogger.